Dalton Spring Water is genuine Vermont spring water delivered to you direct from the majestic green mountains of Vermont. When we say one source this means that we only use one spring source for all of our Dalton brand spring water products. Many of the big bottled water producers use multiple sources and blend their water. This can adversely affect the taste of the water due to changes in the natural mineral content (calcium, magnesium, sodium etc) present in each water source. That is why we use only one source and why so many of our customers marvel at the taste of Dalton brand genuine Vermont spring water. Pristine Mountain springs is located along Vermont's historic route 100 which meanders the entire length of the state from north to south. The town of Stockbridge pop. (674) is located approximately 14 miles north of the Killington mountain ski resort. The water flows from the spring at a cool 48 degrees year round over to the bulk water loading station. Here it is collected into a 35,000 gallon sanitary grade stainless steel silo to await the arrival of the transport tankers. During the loading process the water is mixed with ozone gas (O3) a tri-atomic form of oxygen (O2) which will revert back to oxygen in a matter of hours but acts as a powerful sanitizer in the interim. It takes about 18 minutes to load our 8100 gallon 2010 Tremcar sanitary grade stainless steel tank trailer. Then its off to the bottling plant 175 miles away in Abington, MA. It's a long way but the quality of the water makes the trip worthwhile. Upon arrival at the plant before the tanker is off -loaded we collect 3 samples to conduct routine quality control analysis of the water. One sample is analyzed for total coliform bacteria, (2) for hetertrophic plate count (HPC) and we also record the ozone level in the water. The water is then off loaded from the tanker, passes through a 1 micron (absolute) filtration system capable of removing cryptosporidium and giardia cysts and into one of our 10,000 gallon silo's inside the plant. During bottling operations we perform another 8 quality checks per hour to ensure a high quality product reaches our customers. In addition we have an independent laboratory verify our water quality analysis and our plant is inspected by the local board of health as well as the Massachusetts department of public health. For more information and pricing please click the contact button to submit your request. The following are instructions on how to clean and sanitize your water cooler. We recommend doing it every six months. We like to remind people to change their clocks in the fall and spring, change the batteries in their smoke detectors and sanitize their water coolers. PLEASE READ WARNING LABEL ON HOUSEHOLD BLEACH CONTAINER. DO NOT USE ANY SCENTED BLEACH PRODUCTS FOR THIS PROCEDURE. UNPLUG COOLER FROM ELECTRICAL OUTLET, and remove bottle. Drain any water from the reservoir using cold (blue) valve. Remove no spill adapter from reservoir, pull straight up. Remove plastic baffle from reservoir, pull straight up. Reservoir may contain ice ring, this is normal. Add 1 gallon of warm NOT HOT water to reservoir, then carefully add 1 teaspoon of bleach to reservoir and swirl to mix. Let solutions stand for 10 minutes. Wash off plastic baffle with warm soapy water and rinse thoroughly. Do not place in dishwasher. Remove drip receptacle and add 2 teaspoons of bleach, then fill with hot water. place grate (if any) inside receptacle and let stand. Do not put in dishwasher. Wash exterior of cooler with warm soapy water then wipe dry with a paper towel. Wash no spill adapter with warm soapy water and rinse thoroughly. Drain cooler reservoir using cold (blue) valve and wipe down the inside of the reservoir with a paper towel. Wipe down faucets with a paper towel then discard. Add 1 gallon of water to reservoir and rinse through cold (blue) valve. On hot & cold coolers make sure to rinse at least 1 quart of water through hot (red) valve to remove any solution from hot water tank. 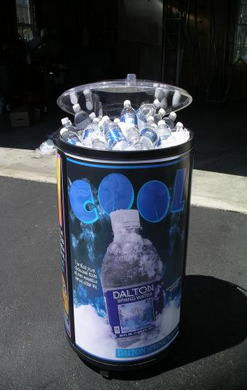 Replace baffle in reservoir, install no spill adapter and install new bottle on cooler. Empty drip receptacle, rinse with warm water, dry and replace on cooler. 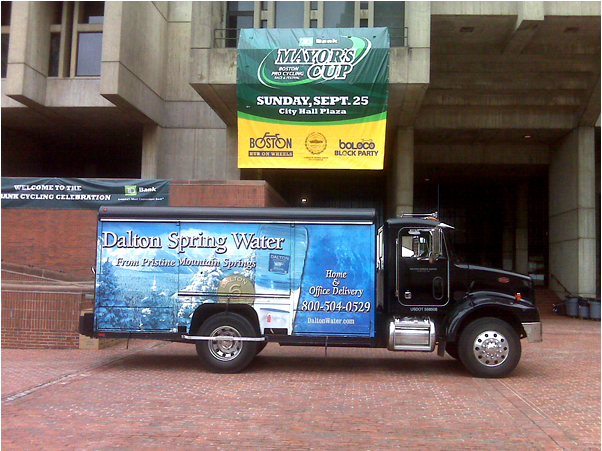 Dalton Water Company provides bulk water delivery service in the Boston Metro Area, including Waltham MA, Burlington MA, Braintree MA, Randolph MA, Brockton MA, Woburn MA, Norwood MA, Westwood MA, Quincy MA, Framingham MA, Brookline MA, Somerville MA, Everett MA, Weymouth MA, Cambridge MA, Dedham MA, Newton MA, Wellesley MA, Foxboro MA, Fall River MA, Taunton MA.